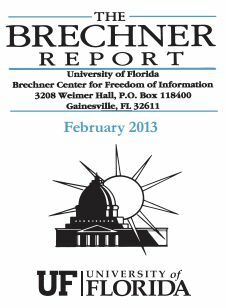 The end of Sunshine Week seems like a fitting time to cross post (with a few updates) this column I wrote for the Brechner Report. The original can be found here. In 2007, the Freedom of Information Act was updated so that FOIA requesters did not have to pay search fees if agencies did not respond to requests within the 20 working days required by the law. In 2009, Jim Bensman filed a FOIA request with the National Park Service for topographical data to make his own digital maps. After 20 days had passed, the Park Service informed Bensman that their FOIA regulations still required him to pay an estimated $1,387.20 in fees, despite the new FOIA law. Bensman went to court, and the Department of Justice (DOJ) defended the Park Service’s illegal FOIA practice until the bitter end. To study why improvements to the FOIA were not being followed by agencies, the National Security Archive conducted its first FOIA Regulations Audit. FOIA regulations have been described at FOIA training conferences as the key tool FOIA officers must have at their desk to ensure they are processing requests correctly. Disturbingly, our audit found that the Park Service, part of the Department of the Interior, was not alone in its negligence. Fifty-three agencies have not updated their Freedom of Information Act regulations since the OPEN Government Act of 2007; fifty-nine agencies have not updated their FOIA regulations since U.S. Attorney General Eric Holder issued his March 19, 2009 memorandum on improved FOIA practices. So who is responsible for ensuring that regulations are up to-date and reflect recent iprovements to FOIA? The DOJ’s Office of Information Policy (OIP), at least in theory. But the DOJ has not updated its own regulations since 2003. Worse, the DOJ OIP recently proposed new regulations that would have been misleading to FOIA requesters about the existence of some documents, exempted online publications from being considered news media, and disqualified most students from receiving FOIA fee waivers. New regulations do not necessarily mean good regulations. misinterpreted,” “misconstrued,” “didn’t necessarily understand” the new regulations. As Bensman’s case shows, DOJ OIP’s role as a constant defender of agency FOIA practices, even if they are illegal, leaves it ill-suited to serve requesters by pressuring agencies to update their regulations to reflect FOIA improvement. This means that the White House must play this role. Lisa Ellmann, President Barack Obama’s Chief Counselor for the Open Government Partnership, recently stated that she views Obama’s second term as an opportunity to “chart a new course toward open and responsive government.” She was quick to point out, though, that “FOIA is not my area of expertise.” Apparently, it’s no one’s. The good news is that the White House can compel agencies to improve how they follow FOIA. The day after our 2010 FOIA Audit, Rahm Emmanuel and Bob Bauer sent a sharply worded memo to every federal agency instructing them to improve their FOIA shops. The next year, our 2011 FOIA Audit showed that half of all agencies had followed the memo’s instructions. Early in Obama’s first term, Special Counsel for Ethics and Government Reform, Norm Eisen successfully played the role of FOIA enforcer, using a near constant barrage of emails to ensure that FOIA shops government-wide were improving. His departure to the Czech ambassadorship in early 2011 has left a void in the administration that has not been filled. For Obama’s inspiring FOIA visions to become concrete FOIA realities in his second term, he must install a new FOIA beat cop. That beat cop’s first task should be to require that all agencies update their FOIA regulations to match the Obama administration’s FOIA expectations. Americans should be able to turn their government’s data into maps without being intimidated. What about the Office of Special Counsel, which has been given the explicit authority to investigate allegations of “arbitrary or capricious withholding of information prohibited under [5 U.S.C.] section 552”? That authority can be found at 5 U.S.C. 1216.